Tuna are a group of ocean fishes from the family Scombridae, particularly of the genus Thunnus. Tuna are fast swimmers, and some species are capable of speeds of 70 km/h (43 mph). Unlike most fish, which have white flesh, the muscle tissue of tuna ranges from pink to dark red. The red coloration derives from myoglobin, an oxygen-binding molecule, which tuna express in quantities far higher than most other fish. Some larger tuna species, such as bluefin tuna, display some warm-blooded adaptations, and can raise their body temperatures above water temperatures by means of muscular activity. This enables them to survive in cooler waters and to inhabit a wider range of ocean environments than other types of fish. In the United States, only Albacore can legally be sold in canned form as "white meat tuna"; in other countries, yellowfin is also acceptable. While in the early 1980s canned tuna in Australia was most likely Southern bluefin, as of 2003 it was usually yellowfin, skipjack, or tongol (labelled "northern bluefin"). As tunas are often caught far from where they are processed, poor interim conservation can lead to spoilage. Tuna is typically gutted by hand, and later pre-cooked for prescribed times of perhaps 45 minutes to three hours. The fish are then cleaned and filleted, canned, and sealed, with the dark lateral blood meat often separately canned for pet food. The sealed can itself is then heated (called retort cooking) for 2 to 4 hours. This process kills any bacteria, but retains the histamine that can produce rancid flavors. The international standard sets the maximum histamine level at 200 milligrams per kilogram. An Australian study of 53 varieties of unflavored canned tuna found none to exceed the safe histamine level, although some had "off" flavors. Australian standards once required cans of tuna to contain at least 51% tuna, but these regulations were dropped in 2003. The remaining weight is usually oil or water. In the US, the FDA regulates canned tuna (see part c). In 2008, some tuna cans changed from 6 ounces (170 g) to 5 ounces (140 g) due to "higher tuna costs". Canned tuna can be a good source of omega-3 fatty acids. It sometimes contains over 300 milligrams (0.011 oz) per serving. In a bowl, combine the first 8 ingredients. 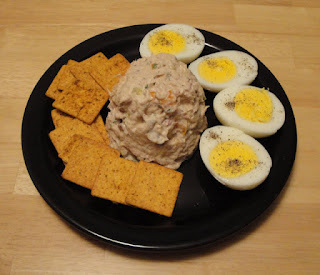 Arrange the tuna, eggs and crackers on a plate. Enjoy! I loveeeeee tuna salad. Never tried with walnuts. Will have to give that a whirl. Oh my! that platter looks so good, tuna and eggs and crackers sound such good combinations, all my favorites:D Can imagine myself enjoying this while chilling in front of the tv:D hope you have a great day! I love tuna this looks awesome! Hi Christine, I have made a few of your recipes and they all came out good. Will have to try the tuna platter. Keep up the good work. I am loving this platter. I love tuna salads and now we are having them even more often.. Tuna, eggs and mayo really taste great and addition of some veggies and nuts make it even better. That platter looks awesome! Thanks so much for the wishes! Hmm, the walnuts addition is neat! Nice platter. Congrats on the award! Your tuna salad does look tasty. I like your variation here with the bell pepper and the nuts, great recipe! This is a nice light lunch--easy to pack and full of protein!